Think One Person Can’t Do Much? How about two? This is the story of a childhood dream and lifelong passion and perseverance. We start our story when two Guinean brothers—Abdoulaye and Ibrahima Barry—are 10 and 14 years old. They loved school, and were frustrated that their native language, Fulani, didn’t have its own writing system. Fulani is a traditionally oral language spoken by about 40 million Fula people across western and central Africa. Like so many oral languages worldwide, people end up transcribing them using an existing script—they superimpose a foreign alphabet onto an existing oral language. This type of practice is rather imperialistic and it usually doesn’t work very well. Such was the case with Japanese, an oral language written in Chinese characters until Prince Shohtoku invented two indigenous syllabaries for the language—hiragana and katakana—in the tenth century. Today Japanese remains a complicated written system of four different scripts, if we include the Chinese kanji, the two kana syllabaries, and the Latin romaji to which it’s often transliterated. The boys taught Adlam to friends and family, and had the inspired idea to ask each student to teach three others. They transcribed school books using the new script, and in junior high started teaching larger groups of people in markets and neighborhoods. Their father’s relative, an official in the local government, came to the house for a demonstration. He was impressed when he found that the boys could consistently, independently, and accurately transcribe one another’s speech from separate rooms. In 1993, as a high school student, Abdoulaye, traveled to Conakry, Guinea’s capital city, and wrangled his way onto a popular radio show to promote the new script. “That’s how the whole country learned about Adlam,” Adboulaye said. Many Fula people are nomadic, so the script spread quickly among traders and farmers—from Guinea to Senegal, Gambia, Sierra Leone, and the Ivory Coast. More and more books were converted to Adlam, but they were written by hand and copied by machine, a very cumbersome process. The process of propagating a new script wasn’t always easy; Ibrahima was imprisoned for a time after police officers raided his Adlam study group at university. Upon graduating, Ibrahima started a Fulani-language newspaper, also written by hand and photocopied. New writing systems aren’t created all that often. The most widely used scripts in the world today—Latin, Chinese, Arabic, Devanagari, and Cyrillic—are all thousands of years old. In 1959, Hmong spiritual leader Shong Lue Yang created the 81-symbol Pahawh script, though RPA romanized characters are still very popular. The Cherokee syllabary is a success story: Sequoya created the script in 1821 and seven years later a Cherokee-language printing press published the Cherokee Phoenix newspaper. Cherokee was added to the Unicode standard in 1999; in 2003 Apple created a Cherokee keyboard; and Google has recently helped implement Android support for the alphabet. To take Adlam to the next level, the Barry brothers figured they could skip the printing press and go directly to computers. They both ended up emigrating from the west coast of Africa to the west coast of the USA—to Portland, Oregon—pursuing their educations and working. They paid for the development of an Adlam keyboard and font. In 2008, they were thrilled to finally be able to type Adlam for the first time. However, because Adlam wasn’t yet supported by Unicode, readers had to have the font installed on their system. Several years later, after Ibrahima presented at a type design conference in Colorado Springs, the brothers were introduced to Deborah Anderson, a linguistics researcher, who leads a program called the Script Encoding Initiative, at UC Berkeley. Along with Michael Everson, one of the co-authors of the Unicode Standard, the SEI has added more than 70 scripts to the Unicode standard since 2002! Kudos to these incredible Cultural Detectives! SEI’s site tells us that over 100 scripts remain to be encoded, and asks for donations to support the effort. UNESCO, the USA National Endowment for the Humanities, and Google all support the Initiative. The effort includes historic scripts, such as expanding the set of supported Egyptian hieroglyphs, as well as focusing on scripts used by religious and linguistic minorities—to promote literacy and education in native languages. In 2014, at a meeting of the Unicode Technical Committee in Sunnyvale, California, yet another milestone was achieved—Adlam was approved. It was included in Unicode 9.0 which was published this past summer. However, you won’t yet find it on your cell phone; technology companies haven’t leapt on the Adlam bandwagon. One hope is “Noto,” an enormous font family that aims to support 100% of the scripts in Unicode 9.0. Finding Adlam on your operating system won’t happen overnight, but hopefully it won’t be much longer. A second hope is that Fulani speakers have started creating their own apps: one to text in Adlam and the other to learn it. Twenty years on, the Barry brothers are now 36 and 40 years old, and Adlam is taught in over ten countries. Ibrahima recently finished writing a book on Fulani grammar, and he plans to create a dictionary as well. Both brothers want to open more schools in Guinea and nearby countries that teach children in their native languages. Martin Luther King, Jr., had passion, a dream, and perseverance. Gandhi had those three qualities as well. Fortunately for speakers of Fulani, so do Ibrahima and Abdoulaye Barry. The original article in The Atlantic is much longer than my summary here; be sure to read it if this has piqued your interest. And be sure to log into your subscription to Cultural Detective Online now, to help define and preserve your culture! 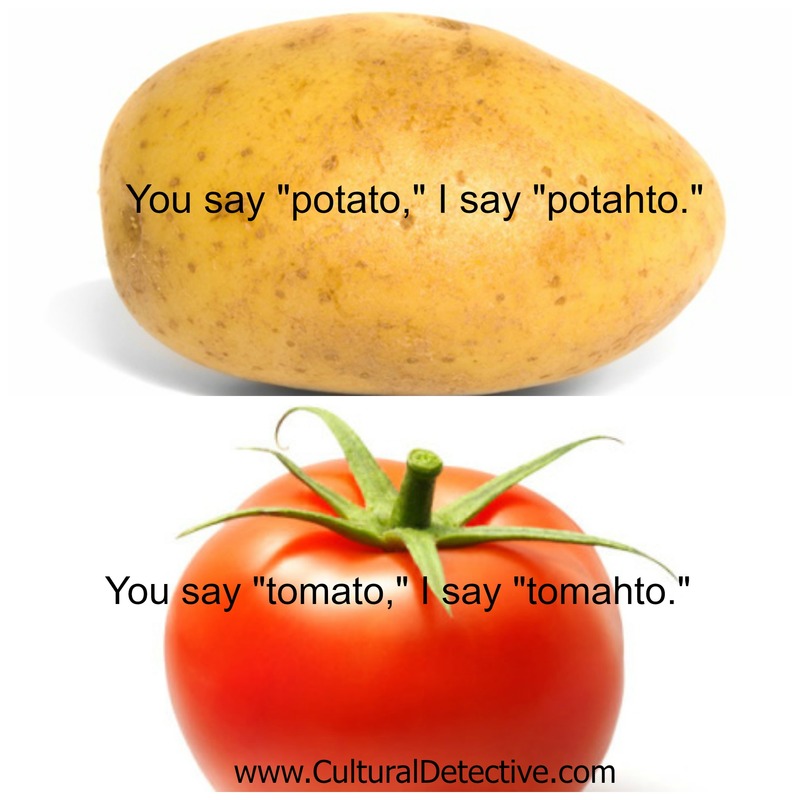 I recently came across the best “Cultural Effective” (yes, that’s a play on “detective”) I’ve seen in a long time! He has my deepest respect, and he has me rolling on the floor laughing, as well. I found him via an article that had a photo of a skinny, long-bearded Sikh man posing as—wait for it—Captain America! He had his shield, tights, and turban on, and was ready to fight for justice. Of course it got my attention. I absolutely loved it! The article was an interview with Vishavjit Singh, an engineer, writer, educator, activist, costume player, and the artist behind the terrific series, SikhToons.com. 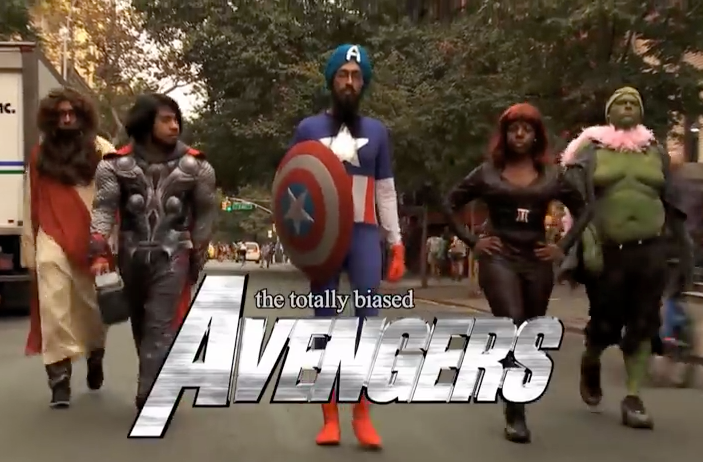 If you think Sikh Captain America sounds interesting, how about a complete set of Totally Biased Avengers, fighting for justice and equity in our world? They are the brainchild of the talents over at Totally Biased, and include Asian Thor, Black Black Widow, Gay Hulk, and brown Jesus Christ. You readers know that Cultural Detective is awfully cool and helpful, but these Avengers may have us beat, lol. Do yourself a favor and watch the video below. But be careful, you will laugh out loud. 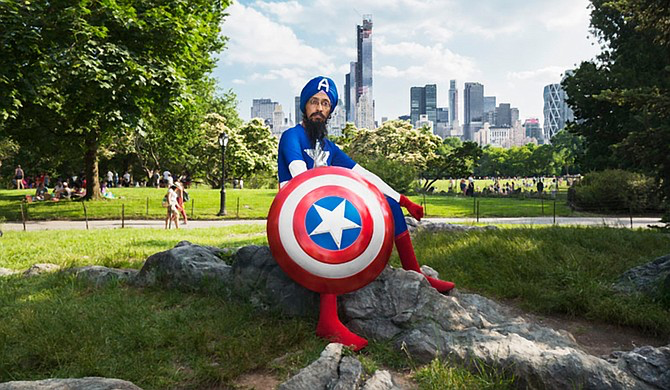 Getting back to Sikh Captain America, however, you have got to check him out. He, er, rather, his alter-ego, Vishavjit, is doing wonderful work in the world! 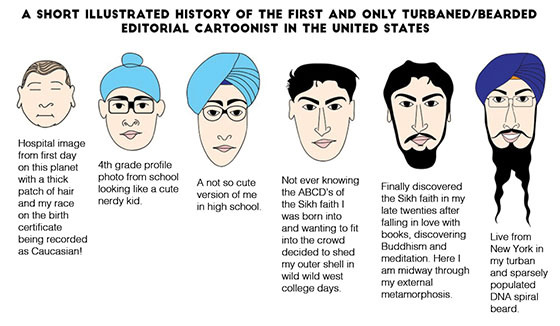 Take a look at his terrific flip book on turbans, for example. Visit his website or follow him on social media to see his latest cartoons and other ventures. I especially appreciate how he teaches people to respond to bias respectfully, rather than sinking to the same level of ignorance or, worse, anger. He demonstrates patience, intelligence, empathy, humor, and both visual and verbal communication skills—definitely a superhero combination! Vishavjit made a cartoon explaining the road he followed to get to where he is today. Those of us interested in the pathways to reconciling Blended Culture identity will no doubt resonate with it. The lightness yet levity with which he operates in the world is especially impressive when you consider he survived the civil unrest that resulted in the deaths of so many Sikhs in India. Way to go, Vishavjit!!!! Bless you! It is a pleasure to be with you on a journey to build intercultural respect, understanding, and justice in our world. And you seem to be having so much fun doing it! This post is part of the #MyGlobalLife linkup. Remember the goal of intercultural communication? To help us be able to better understand one another, talk to each other, collaborate, and make our communities and our world a better place in which to live? Sometimes, however, I get discouraged that my beloved intercultural field has lost its way. It’s great that we now have so many PhD and MA programs, but when did intercultural communication become all about dimensions and theories? Or about exercises and activities without an underlying coherent design? Yes, perhaps these are expected mid-life or late-career gripes. 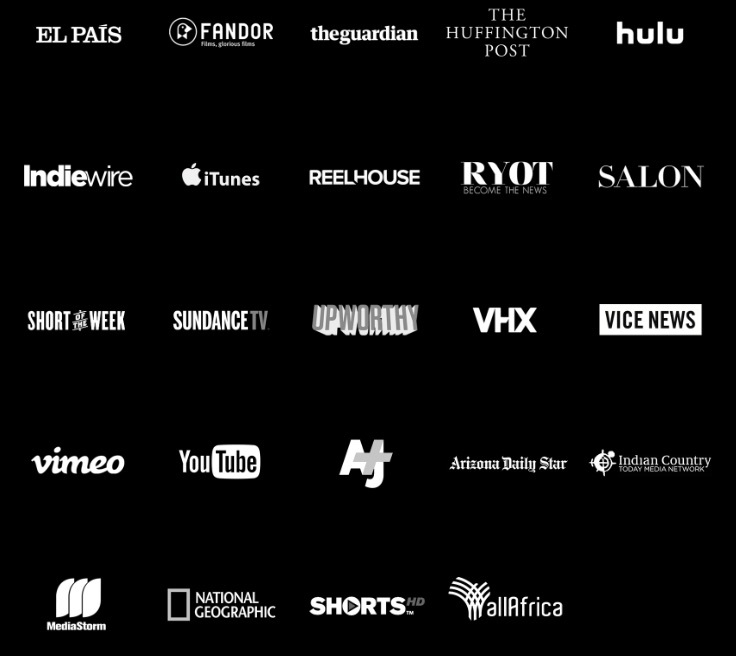 Then I come across a movie entitled, “The World Is As Big Or As Small As You Make It,” showcasing a most excellent-sounding project called “Skyping Around the World” by a group called “Do Remember Me: Connect, Dispel, Build,” and my faith is restored. The project gathers youth aged 12-15 at neighborhood recreation centers in France, Kazakhstan, Kenya, Nigeria, Tanzania, Uganda and the USA for a series of workshops that use art for social advocacy and to motivate activism. 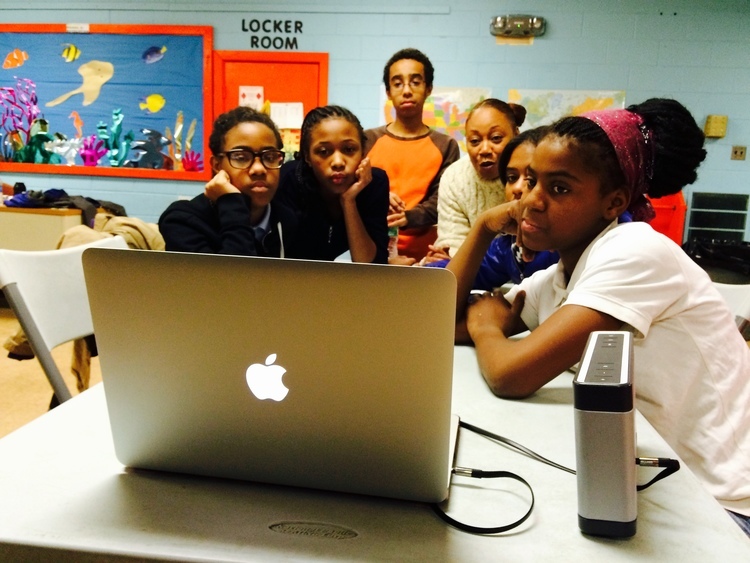 Kids connect with one another via Skype to engage in positive dialogue and dispel the myths of hopelessness, overcome media stereotypes, and bridge cultural differences. Their mission is to delve deeply to find their common ground, to share experiences, and to work toward actively supporting one another. They encourage activism and advocacy for issues such as peer violence, the absence of leaders and heroes, and many other pressing issues. Regular readers of this blog know that the “contact hypothesis” tells us that merely bringing kids together via Skype isn’t enough to achieve these lofty goals. The meaning they make of their Skype experiences must be facilitated, and that is apparently done, at least in Philadelphia, by two teaching artists, Sannii Crespina-Flores and DJ Lean Wit It. The 12-minute film is most definitely worth viewing. It is embedded it below. Come on, get your cup of tea ready, and prepare to smile and be encouraged. These kids use their phones and iPads, which they would normally use to text local friends, take selfies, or make social plans, to enlarge their worlds by forging friendships with peers across the world. For young people who have often never left their hometown, these exchanges prove to be both touching and surprising, giving them exposure to new corners of planet Earth and encouraging them to witness to the great (and sometimes unfulfilled) potential that exists in their own back yards. “As technology advances, our world grows smaller. Yet, while we are more connected than ever before, we remain separated by the lottery of where we are born. Around the world, people just like you – with the same beliefs, dreams, and aspirations – have drastically fewer opportunities due to extreme poverty and hunger. Through the universal power of storytelling, the Sundance Institute Short Film Challenge will put a spotlight on our similarities—showcasing stories that communicate how we can support one another to end poverty and hunger once and for all. There is a more hopeful future for millions of people around the world, it’s up to us to inspire a positive change together. There is some connection to Global Citizen as well, though I can’t figure out from the website exactly what that affiliation is. The Global Citizen is a platform that advocates for the achievable goal of ending extreme poverty in the world by 2030; it was created in 2012 by the Global Poverty Project. Kudos to the Bill and Melinda Gates Foundation and Sundance Institute, as well as all the sponsors and participating organizations! Some of the other films in this challenge are also very interesting; all highlight successful attempts to bridge cultural differences in order to end world poverty. Watch them here. Yes! That is brilliant and powerful learning! And it is crucial to understand this idea if we are to develop intercultural competence. It is a prerequisite to implementing the four steps to a happier life. To understand the concept better, think about a time when you had a painful miscommunication with someone, the type of miscommunication that haunts you for days or longer. The example I’ll share with you involves a family member, but yours might involve a friend, family member, important client, or colleague. Got your example? Okay, here’s mine. Recently, a family member took exception to a text I sent him. It was classic miscommunication. He felt I had jumped to conclusions about him, specifically, that I had falsely accused him of wrongdoing. His negative judgments and assumptions about me made me sad. This is common; there is a downward spiral that so often happens in miscommunication. We want our family, friends, colleagues, and clients to give us benefit of the doubt, to assume we have their backs. It is upsetting when, instead, they think the worst of us. Communication is a shared process. We send our messages and usually assume that the receivers of our messages understand us. But does our intention, the meaning, as conveyed by our message match the other’s interpretation? This, of course, is the crux of successful communication! Think about your own example. What happened? How did each of you perceive the miscommunication? How did each of you feel? What was the outcome? My relative’s upset was real, as was mine. We can’t and shouldn’t deny our feelings and our reactions. Yet, it was especially important to me that, as a family member, we not feel negatively toward one another. One good outcome of the exchange was that I learned something new about him, and now understand an area of sensitivity for him. That knowledge will inform my future interactions, and hopefully help me to communicate with him in ways he finds more supportive. I am confident that he learned something that will inform his future communication with me, as well. So, did my text “cause” him pain? Did his response “cause” me sadness? Did our differing communication styles “cause” frustration? No, of course not! It is the manner in which we interpret differing communication styles that can cause us frustration and can waste our time, energy, enthusiasm and resources. Your mother may have told you when you were young that your friends can not make you angry; it’s your choice to become angry or not. Differing communication styles can actually strengthen teamwork, and they can add delight to friendships. Now, think about your example of miscommunication. Did your behavior “cause” negativity for the other person? Did their behavior “cause” it in you? Or, rather, was it the way each of you interpreted the other’s behavior—the meaning you gave to it—that caused the grief? In my example, there was no negative energy or assumption embedded in the initial text; I had no thought of accusation. Many times, however, our innocent actions result in hurt feelings or negative perceptions, just as they can also help people feel good. In hindsight my text could have been worded better. A lengthier, more explicit text from me (or, better yet, a phone call) may not have “caused” the reaction it did. However, it was not the text itself but, rather, my relative’s interpretation of the meaning behind my text, that provoked his reaction. We cannot control how others will perceive us, though we can do our best to improve our communication skills. The distinction between behavior causing a reaction versus our interpretation of the behavior influencing us to react in a certain way is an important distinction for cross-cultural and intercultural communication effectiveness. So, what are these four steps to a happier life, to improving your communication with others? The first point to remember is that miscommunication happens—every day, even between loving couples, family members, and friends. How much more frequently can miscommunication happen, then, between strangers or those who come from very different cultural backgrounds? When we find ourselves in an uncomfortable communication situation, we need to remember not to place blame. It’s happened; miscommunication is natural and normal. But we can use it as a learning opportunity—a chance to understand more about ourselves and others. As the Cultural Detective Method shows us, when we find ourselves involved in miscommunication, or feeling a bit frustrated or judgmental, we are wise to take a look within ourselves. What are my assumptions? What beliefs am I using in my interpretation of events? What does the way I feel tell me about what is important to me? What values do I hold in relation to this situation, and how do I link them to appropriate behavior? Our past experience and “common sense” (really “personal cultural sense”) cause us to interpret actions in certain ways. Becoming aware of those filters, the ways we view the world, can help us know ourselves better, to be better able to understand and anticipate our own responses, and better able to explain ourselves to others. Once we’ve taken a look into ourselves, it’s time to try to put ourselves into the shoes of the other. Even though we might perceive behavior as negative, let us temporarily, while we think this through, give the benefit of the doubt. What might be other, positively intended reasons that the person did what they did? Of course, I can also consider whether I know this person to “have it in” for me. Does this person have a history of attacking me, or of acting unprofessionally? If not, the above “positive intent” exercise becomes even more important. Finally, it’s time to reach out and take action to resolve the miscommunication. Preferably, this includes a combination of apologies for discomfort, questions that seek to understand, explanation of intent, and summary of what has been learned. It should, also, ideally culminate with a path forward: how we’ll try to communicate more effectively with one another from this point on. If you haven’t yet joined us for one of our monthly webinars, please do. Those attending receive a complimentary three-day pass to Cultural Detective Online, a tool that can help you integrate these four steps so that they become second nature in your daily life. And, please, share the invitation with your friends, colleagues, and clients! Let’s make this world a happier and more interculturally effective place! Today, nearly a fifth of Alaska’s population identifies some Native heritage, the survivors of peoples in the area for the last 15,000-30,000 years. 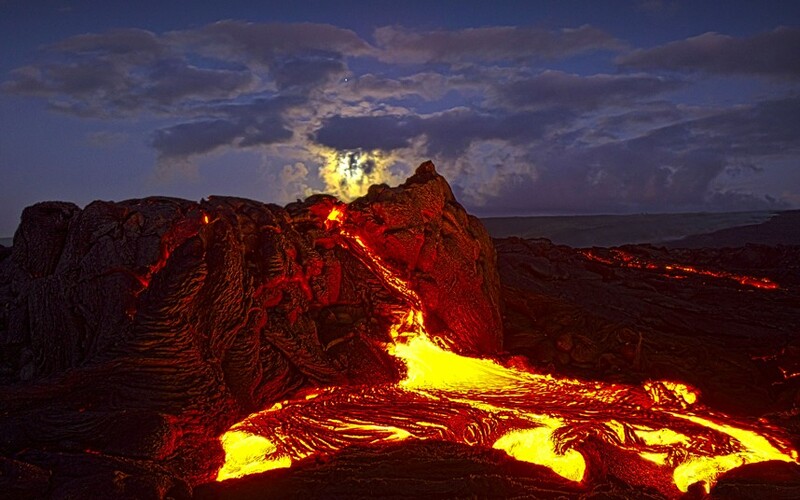 They have adapted to the growth and decline of glaciers, and the changing land, climate, and resources. Prior to European contact, they probably numbered 80,000-90,000, with dozens of distinct cultures. After contact so many died, primarily due to disease, that by the first US Census in Alaska (1880), the Native population was just under 33,000. Many of the traditional ways have been lost, but increasingly many people are working to save the remaining fragments of their cultures. 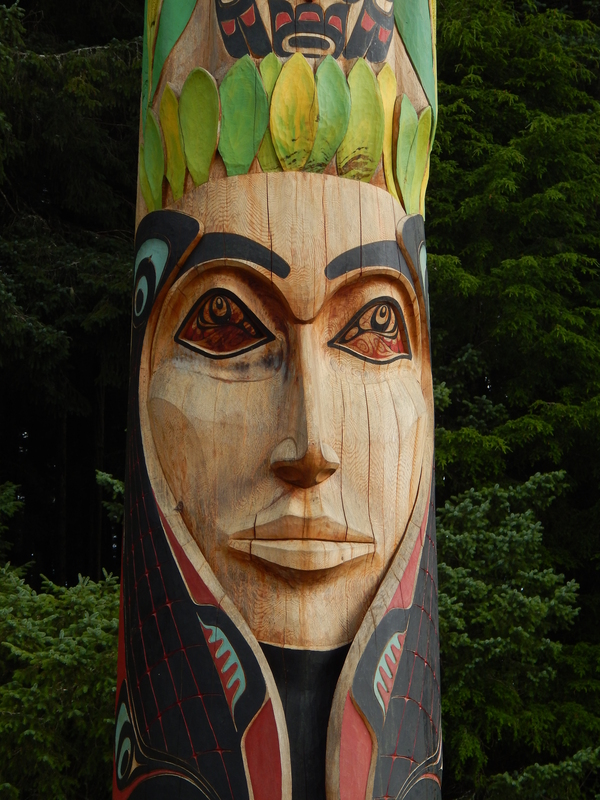 Totem poles have disintegrated—wood doesn’t survive forever in this temperate rain forest. Traditional arts and crafts methods and skills have almost been lost—only a few elders remember the old ways. And native languages are rapidly losing speakers. Yet there is hope because the younger generation realizes what is slipping away. Cultural arts centers are teaching traditional carving methods, beadwork, and weaving, and the young are learning dances from their elders. I was privileged to hear Joe Williams, a distinguished member of the Tlingit tribe, share a little about his culture. 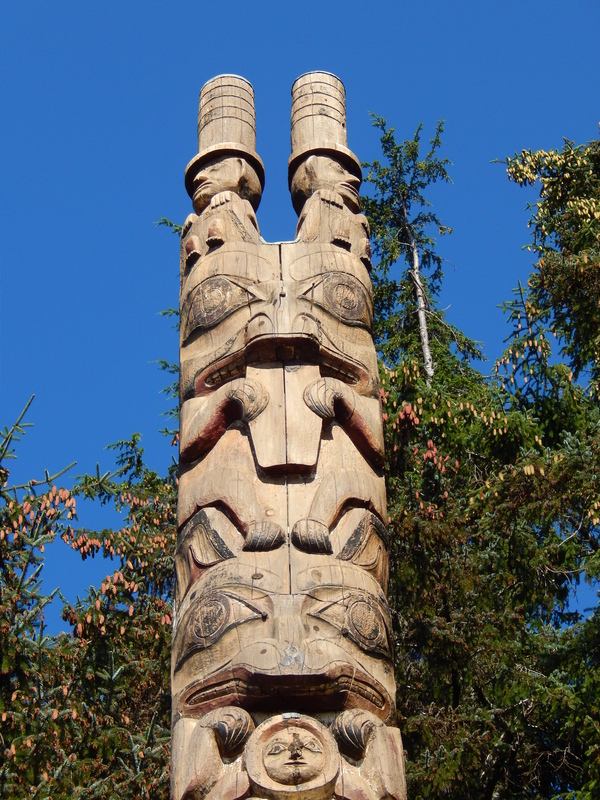 The Tlingit (pronounced roughly like “cling kit” or “clink it”) are the indigenous peoples of what we now call Southeast Alaska. Their name for themselves is Lingít, meaning “People of the Tides.” Click here for a good short history and cultural context of the people. 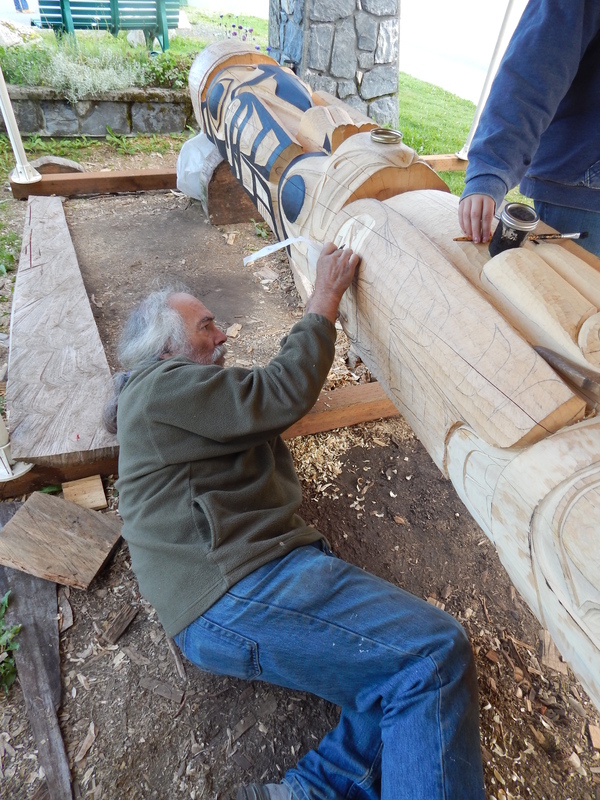 Joe was not taught the Tlingit language or traditional ways when he was young. At that time in the US and Canada there was blatant cultural imperialism and systemic discrimination against native peoples. Native children were taken from their villages and placed in boarding schools miles from family and home. The emphasis was on “civilizing” native populations by forcing them to give up their language and customs, adopt Christianity, speak English, and generally act like “good” Europeans. Fortunately, this attitude (and the law) has changed, and multicultural diversity is more valued in the US these days. Many tribal members from the younger generation are learning, cherishing, and preserving their native heritage for those who come after them. There are organized programs for tribal members to learn their native language. I met adult language students who receive their Tlingit vocabulary-word-of-the-day on their smart phones! Who says you can’t blend the old and the new? Cultural transmission in action?! Perhaps Tlingit culture will survive another 10,000 years, after all! I’m going to tell you a real story, of an actual person, who was promoted to a management position from an administrative assistant position because of a three-hour workshop she conducted for her bosses. How’d it happen? The woman, let’s call her Yolanda, worked for a very large multinational in Texas. The firm, of course, did a lot of business with Mexico. Over the ten years or so Yolanda had been with the company, she’d worked for a succession of bosses, most of whom did not understand Mexican culture and had committed many errors, losing opportunity and revenue, as well as credibility, for themselves and the company. Yolanda is Mexican-American, and her bosses’ actions used to frustrate and embarrass her. She could see that her bosses could be a lot more effective, she wanted to help, but she didn’t know where to begin to explain Mexican culture to her bosses. She was an administrative assistant, not a consultant, executive coach, or trainer. Enter Cultural Detective. Yolanda looked over the Cultural Detective Mexico package. It made sense to her. She intuitively understood the values in the package’s Mexican Values Lens. She could tell stories from her own organizational experience to illustrate each value and correlating negative perception. Yolanda had so many stories, stories that were real, that had cost her company money and, in some cases, staff. Yolanda got her four bosses to agree to a three-hour “lunch and learn,” during which she’d teach them about Mexican culture. She was excited, but she was also scared. She wasn’t a facilitator, she’d never studied culture or cross-cultural communication. But, she knew her organization, she knew her bosses, and she knew both US American and Mexican cultures. So, she gave the workshop her best. At the outset of her seminar, Yolanda told her bosses a story—a story they clearly recognized from their own experience, a story of a time they’d been frustrated, and less than successful. They all knew the details; she had only to remind them of the event she was talking about. Yolanda drew a Cultural Detective Worksheet on the flip chart. She asked her bosses what they had done in that situation. Then, she asked them to think about why they had done what they’d done—what was the underlying “common sense” that motivated their behavior? That wasn’t so easy, but they did it. And it proved pretty insightful. They hadn’t consciously thought about the reasons for their actions, hadn’t spent time thinking about how culture-bound their behavior was. This was Yolanda’s first successful “aha” of the three hours. Her bosses came up with several guesses—possible motivators of their Mexican counterparts’ behavior. Then Yolanda filled in a couple more, explaining the reasons these colleagues had probably acted and responded the way they had. Her bosses said things like, “That makes sense,” “I’d never considered that before,” and “so I did exactly the wrong thing; I shot myself in the foot!” Her bosses experienced their second “aha” of the workshop. Next, Yolanda handed out a copy of Cultural Detective Mexico to each of her bosses. She walked them through the Mexican Values Lens, telling stories from her organizational experience. She asked them how they felt about each of the values, and reminded her bosses that each Mexican is unique—that the values in the Lens are societal tendencies. After introducing the Values Lens, she focused her bosses’ attention back on the Worksheet. Now they had lots of ideas about why their Mexican colleagues might have acted the way they did. And even more importantly, her bosses had lots of ideas on how they could have acted in ways more conducive to achieving their business objectives—to bridging cultures. A third round of “aha” learning was achieved. The three hours sped by quickly. Her bosses learned so much. Their ability to do business in Mexico and with Mexicans was greatly enhanced. They learned about themselves, about their own personal and US cultural values, which enabled them to better explain themselves to any new colleague, whether Mexican, Chinese, or US American. And, very key to me, Yolanda’s bosses learned what a valuable asset she was as a cultural resource. They began using Yolanda as a sounding board, asking her to help them write emails and reports, and also to help plan strategy. Within a couple of months, Yolanda left her job as an administrative assistant because she was promoted to a more prestigious and much better paid management position. She achieved her dream of being able to travel for business, and she loved the kind of work she was able to do. Her company gained an employee who was confident and able to use her bicultural heritage in ways that added value. Now, I’m not promising that using Cultural Detective will get you a promotion, but if you and your organization work across cultures—and what organization doesn’t these days—you will definitely gain a whole lot of skill and expertise by using Cultural Detective. Add it to your priority list! Start building your intercultural competence by attending one of our free 90-minute webinars, or subscribing to (and using!) Cultural Detective Online today.